Third Edition: Thoroughly Updated and Expanded, with Extensive New Coverage! In just 24 sessions of one hour or less, you’ll master the entire SAP project lifecycle, from planning through implementation and system administration through day-to-day operations. Using this book’s straightforward, step-by-step approach, you’ll gain a strong real-world foundation in both the technology and business essentials of today’s SAP products and applications—from the ground up. 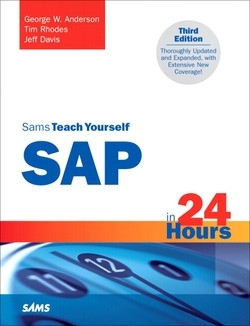 Step-by-step instructions walk you through the most common questions, issues, and tasks you’ll encounter with SAP. Case study-based exercises help you build and test your knowledge. By the Way notes present interesting pieces of information. Did You Know? tips offer advice or teach an easier way. Watch Out! cautions warn about potential problems.